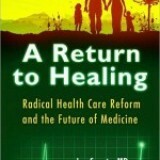 Shifting the model of health care from "disease" care to "health" care is necessary if we're going to enjoy good health. Preserving our level of wellness and detecting disease early are critical. Wellness includes body, mind, emotion, and spirit and an understanding of curing and healing. We need a new model: Health Medicine.